Last week I finally got to accomplish a spiritual task I was planning for a long while. But due to a busy schedule — conjure clients, a masters degree, a family, and all that jazz — I had to wait for a summer break in order to build a divination altar. It took me about 5 days from the point of starting to clean and prep the area where I was planning to erect it, to actually having a functional sacred space for devotion and inspiration. 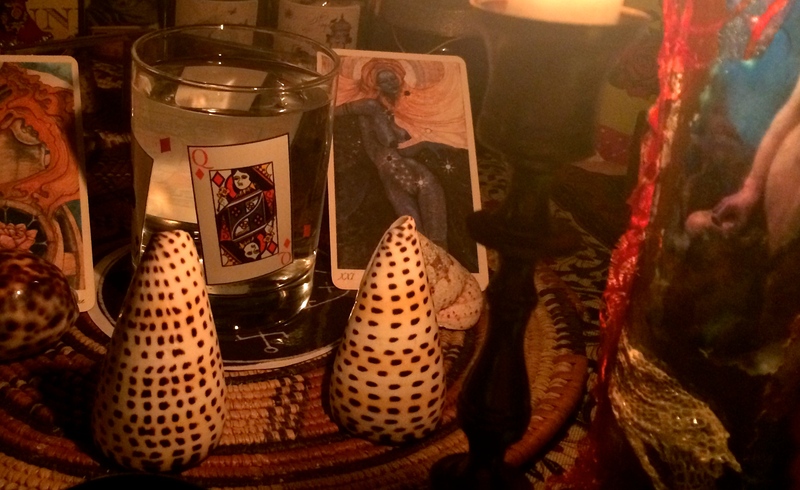 I was taken by surprise when, after posting a picture of my newly constructed fortunetelling shrine, I got many questions about it from folks over social media. After thinking about it I realized that indeed I haven’t seen many images of divination before. What I call a divination altar is a space dedicated to the Spirits I work with when I read fortunes. By honoring my Spirits regularly, my connection with them deepens, and my divination skills improve. Not every one works with Spirits, or knows their Spirits, or is aware of a presence of such energies while divining — and it’s perfectly fine. This is just the way I do it, and how my practice had unfolded throughout the years. In fact, now that I think about it, building this shrine in a first place was a mission given to me by my Spirits of Divination. The pieces on the altar are images, photographs and statuary that has special meaning to me or to my Spirits. For instance, last May, while teaching at the Hoodoo Heritage Festival, I was presented by the sweet, Coastside Conjure, with a beautiful shingle sign made by Carnivalia. Since I am not reading in person, I knew I wanted this large beauty to be the backdrop for my altar. I also keep a few beautiful containers with graveyard dirt — one of them contains dirt from Mlle. Lenormand’s grave site, another precious gift I received from a talented colleague and friend, Balthazar Conjure. The purpose of this post was more to share my thought process and approach to altar building and fortunetelling, than giving you an instructional bulletin. I hope that some of you find this information meaningful, and apply it to your own fortunetelling practices. If you have questions, please post them in the comments section or on my Facebook page. Need a reading? No problem! You can book one here! Certainly my first love, when it comes to fortunetelling, is hand down cards. In fact, I clearly remember sitting on top of my father’s heavy, writing desk, as I spent hours upon hours looking through a fancy deck of playing cards that I would secretly retrieve from the top right drawer, where he kept it alongside a plastic sample pacemaker (… don’t ask… ), and other trinkets I cannot recall anymore. Those cards had traditional-looking pips, and I can’t remember anything really significant about those. 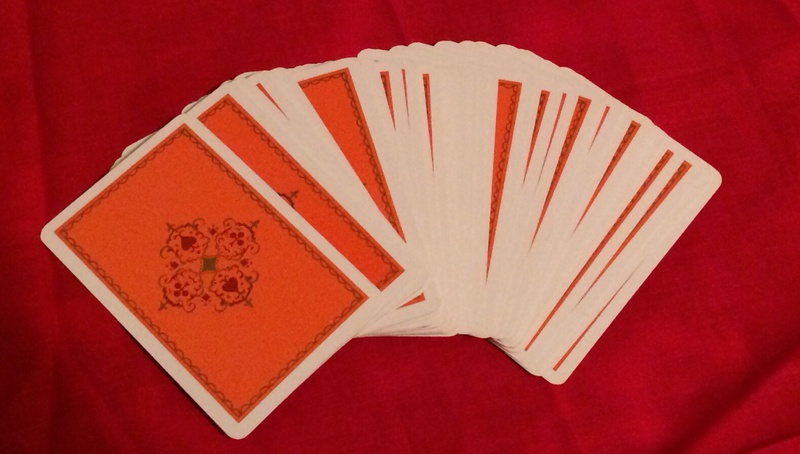 But the face cards… The face cards is a whole other story! They were glorious. 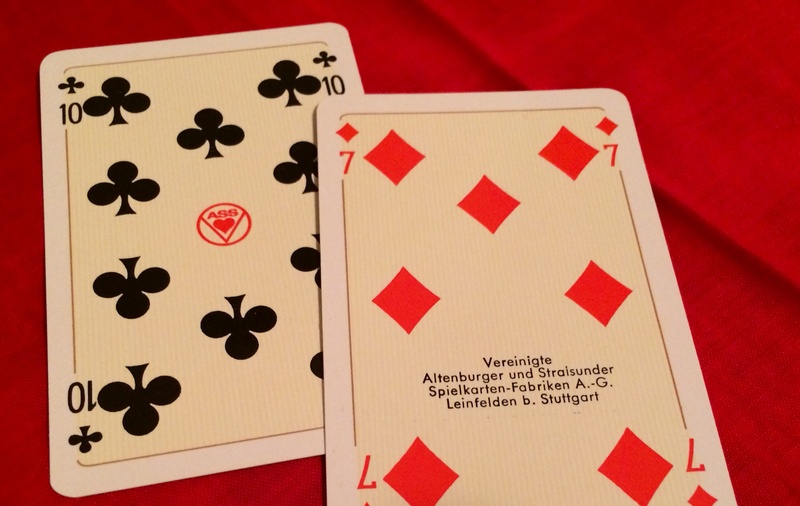 Elegantly dressed with some German flare to their coats, the face cards seemed to look straight at me each time I would pull one. 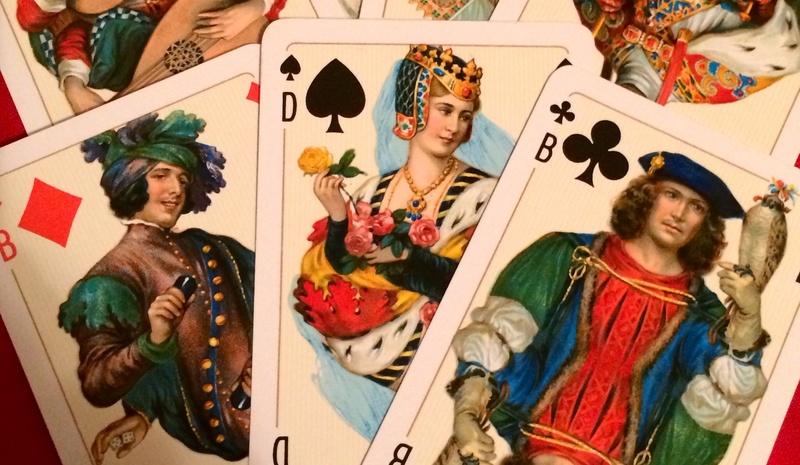 Liberally, the picture cards shared with me stories of old kings, regal queens, and boisterous knaves. They even gossiped about one another, whispering into my mind’s ear about embarrassing moments unworthy of royalty. Their tales echoed in the castles of my young imagination. 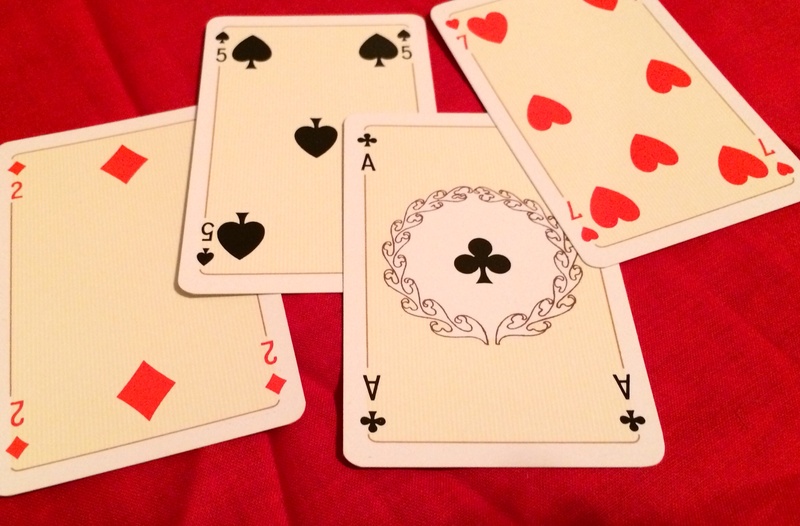 And as these face cards danced out their royal affairs right next to me, their glossy card stock stood out against the deep brown of my father’s old writing desk. I spent many days with that deck, handling it with love, admiration, and fascination. Many years have passed since, and I never thought I’d see those cards again. That lovely deck, as other non-essential belongings, had to be left behind the iron curtain as we immigrated from USSR to Israel in 1988. Fast forward to late 2013 — 25 years later. I look through an online card archive — not an unusual activity for a card addict… ahem… collector, like myself. And boom! I recognize one of my old idols. Holding my breath in disbelief I wonder. 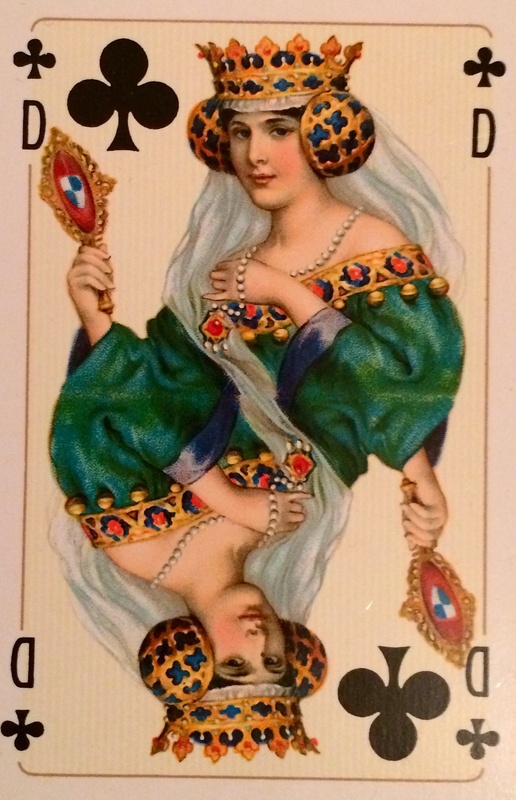 The Queen of Clubs looks at me mischievously, glaring like a computer screen supernova in the unsuspecting darkness of my bedroom. Not a sign of aging on her perfect card face. The coquettish Queen seems to recognize me. Nodding just so slightly, the Queen slowly faces away from her fancy hand mirror, forcing my attention to her royal and elaborate headdress. She certainly knows how to wear that crown. The thing is, this Queen and I both know that her headdress is the one single, last detail still etched perfectly in my memory. A detail that became associated with a happy, magical, and wholesome part of my childhood. A detail I refuse to let go of — holding on to it like to a life vest, and painting it and again again in a melancholic coat of sweet-stale memories — so it contrasts against the canvas of passing time that starches over new geography of experiences, lined with a multitude of insignificant encounters with significantly less royal packs of cards. 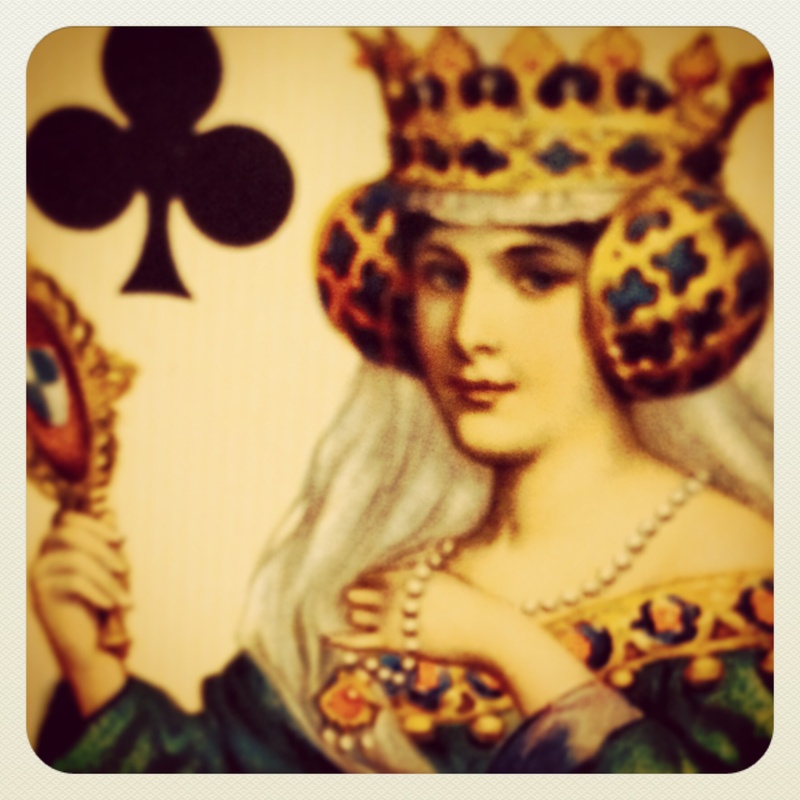 But the Queen of Clubs doesn’t care. She, as any self-respecting queen would, knows that one never forgets her first love. Never! Although not an original, but a reproduction, I now have in my possession a double pack of Prince Karte No. 402, originally manufactured by the legendary Dondorf company. What can I say? I feel pretty damn lucky! I don’t know how about you, but this Mercury Retrograde has been especially brutal for me. I placed orders online that have disappeared into thin air, booked readings with clients, but a mistyped phone number, and had to redo obnoxiously simple tasks over and over again. My life felt like a broken record, and I couldn’t get a grip or change the tune. Emotionally it didn’t feel like a picnic either! Finally Mercograde was over, concluding ceremoniously with an electrifying Lunar Eclipse and a Full Moon in Gemini — oh boy! I feel like all the tension buildup of the past three weeks has finally hit the fan. I definitely feel more clarity, but now all this emotional plaque is right in front of my eyes and I know I have to deal with it. Clearly, denial ain’t going to offer its velvety and familiar numbness this time. I really have to deal with some major personal funk. After speaking with many friends and my regular sitters, I realize that this Mercury Retrograde was hard on many. Relationships in particular were examined under a merciless magnifying glass, while dysfunctionality floated to the surface without reservation. So today, as I am beginning to feel a bit more sane, I pulled a few cards to get a global advice regarding the proper psycho-spiritual approach to the upheaval that is plaguing our lives following this recent astrological phenomena. 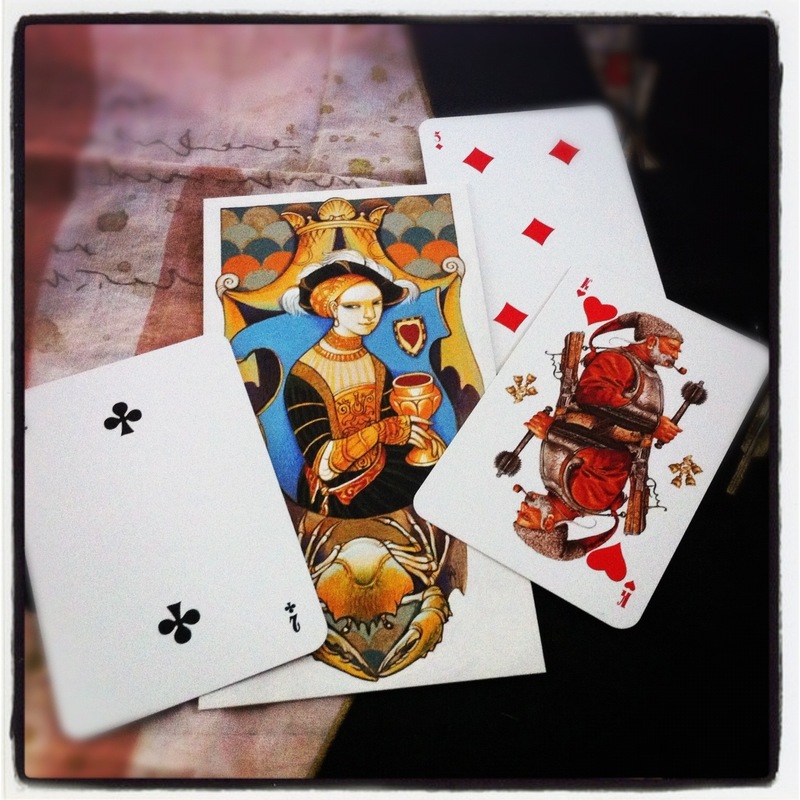 The cards I drew are the Queen of Cups (from Alexander Daniloff’s gorgeous deck), followed by the 2 of Clubs, 5 of Diamonds, and the King of Hearts (made by Alexander Erko’s). For me, the draw mirrored the raw emotional vibration all around that feel as comfortable as exposed nerves during a root canal procedure. But the Queen who had a hard time to keep all her bubbles together recently, and who is usually an expert par excellence in the watery depths of the feelings department, is finally able to integrate all of the emotional memory without drowning herself in it. She can work through it, bringing a much needed healing. 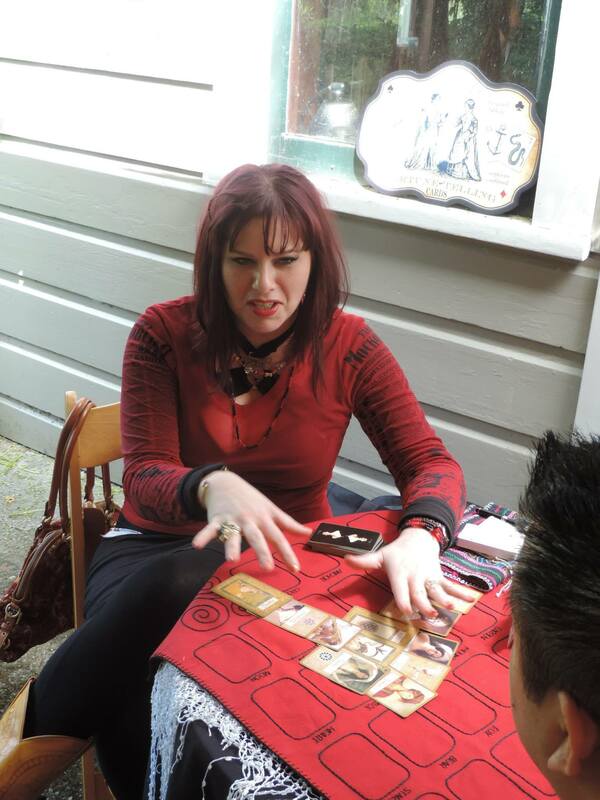 In this deck in particular, she actually looks at the reader with a post-meditation gaze. She’s finally ready to act! The playing cards flanking the Queen prove that the feminine principal doesn’t feel or chooses to be alone anymore (as she felt in the past few weeks). She is ready to connect with a male counterpart — offering him the gift of equal partnership. He accepts his help in dealing with the issues coming up during the past retrograde. Shall we dance?, she asks. Finally, there is a strong underlying karmic essence to all this emotional scab-picking that needs to happen. And this enigmatic Queen reminds us that there are patches of healthy, smooth skin underneath it all, waiting to be loved as soon as the wounds are properly cleansed and dressed. The time has come for real healing to start! Please be gentle with yourselves!